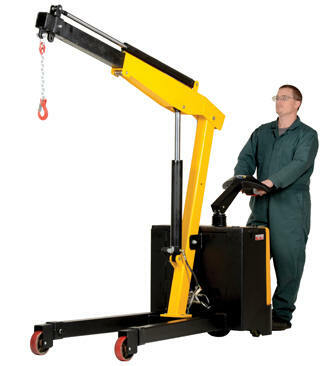 Fully powered shop cranes (power hoist & power in/out boom) for moving loads quickly, easily, and safely. 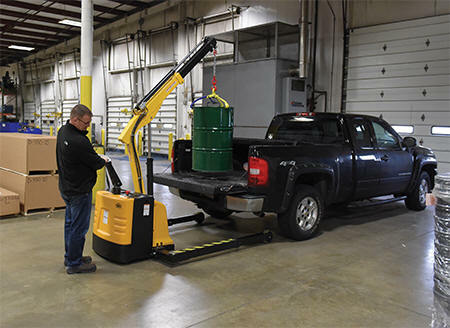 24V DC drive and lift motor handles heavy-duty jobs. Ergonomic handle features easy-to-operate throttle with infinite adjustment of forward and reverse speeds, lift/lower controls, proprietary safety-enhancing emergency reverse function, and horn. Includes an electromagnetic disc brake with automatic dead-man feature that activates when user releases the handle. 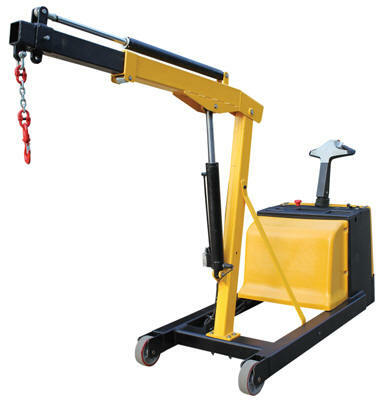 Powered shop crane has two 12V, 80 - 95/Ah lead acid deep cycle batteries, integral battery charger, and battery level gauge. Poly-on-steel steer and load wheels. 3-4 hour operation at full charge - 8 hours when used intermittently. Includes rigid hook with safety latch. *Model EPFC-25 features adjustable length legs. *Model EPFC-25-AA features adjustable length legs and adjustable width legs. *Model EPFC-CB-15 features fixed legs and counter balance design.